Traditional project management specifically emphasizes on conducting a long and detailed upfront planning for all projects irrespective of whether the requirements are known or not. The long upfront planning is emphasised to ensure fixing the variable like time, cost, scope etc. Lot of time is spent on upfront planning these parameters. In today’s fast changing environment, requirements keep changing, and all this upfront planning is wasted if there is a major change in the specification at a later point of time. 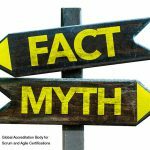 While Agile is a general approach used for software development, agile emphasizes on teamwork, frequent deliveries of working software, customer collaboration, and time boxing events and allowing the ability to respond to change quickly. Scrum is one of most common used form of Agile. Scrum encourages iterative decision making and reduces time spent on unknown variables which are prone to change. Scrum embraces change like no other. Scrum is based on the concept to deliver the greatest amount of value to the customer in the shorted period of time, ensuring a potentially shippable product at the end of each sprint otherwise called iteration. Traditional project management emphasis on linear processes, comprehensive documentation, spends high time on upfront planning; all requirements prioritization is fixed for the lifetime of the project, and works in managed organization. Traditional project management is adverse to changes and follows a formal change management system. The Return on Investment is after the project is closed and the customer inputs or the involvement in the project may vary depending on the project lifecycle. 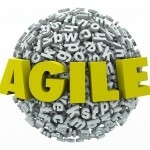 While Agile follows an iterative processes and are divided into sprints of shorter span, as agile is more open to changes in the specification, there is less amount of time spent on upfront planning, prioritization of requirements is based on business value and the product backlog is frequently groomed by the product owner. Agile follows self-organized style as individuals are not managed and the organization is de-centralized. Since Agile is split in iterations they pick up small amount of work and rest can be changed and updated to the prioritized. In Agile the Return of Investment is achieved early as release happens in phased and received throughout the project life. The customer involvement in the project is very high as the development work on the concept of customer collaboration. 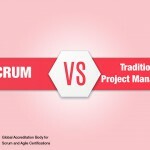 These are the major differences between a traditional vs agile project management. What are the Scrum Roles in Scrum?